It does not happen every day with a Hungarian makeup artist to be invited to Africa. One day my dreamlike model, Irisa Jacobs invited me to her wedding in Namibia. I said yes, of course. Irisa was my model in the creative makeup championship of the Bokeh Fashion Film Festival in South Africa. We won the race and this result has given me more gifts than I would ever thought. It was not even half a year and the beautiful girl who lived in my memory as a gothic queen, set her wedding day and asked me to make her bridal makeup. I love to do makeup, I love to travel, so this invitation surpassed all my hopes and dreams. Adventure and work in the same package! Can anyone imagine or hope more attractive opportunity and challenge? I was packed and started to travel from spring to the hot African landscapes. The excited couple were waiting for me in the capital, in Windhoek. 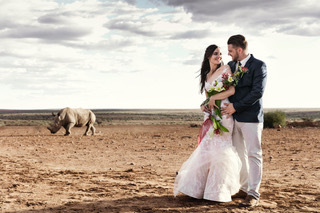 The ceremony was near Mariental, in the heart of the country, in the centre of a safari park. A hilarious complex was waiting for us, elegant central buildings surrounded by tiny house-style buildings, these were our rooms. We had dinner with rhinoceros and antelopes, the experience could not be more touched, nature is very close to humans in this area. It was a wonderful day, and I could never imagine a more beautiful, uplifting and exciting scene for a wedding ceremony. But let’s go back to the goal of the coming. My Namibian bride asked for a subtle make-up, the Swarovski crystal was the only striking element in the composition. I put some in her decolletage too, they were glittering softly in the light. No other jewels were used, it was not needed as the bridal gown was richly decorated. The make-up was dominated by pale pink shades, and this shade of femininity was reminiscent of the eyes and mouth, which I sat through darker tones. The makeup was harmonious, decorated with glitters and highlighters which made the motifs of the eyes and the lips feast. The ombre lips was a great success anyway. Irisa, the bride, is a child of nature, she grew up on a farm in the heart of Africa. Her hair widened in soft waves on her shoulders, there were living flowers adorned just above the fine veil. The dreamlike dress, which was created by a South African designer, Stephen Van Eeden, highlighted her fragile figure. The bride was airy, dreamlike, princess and fairy at the same time. I watched as she walked to the altar. She walked on rose petals and was saying the blessing “yes” under a canopy. The photos were made by the great fashion photographer, Garreth Barclay. He directed the young couple with a real professional enthusiasm and expertise, especially the bride around the venue. He was also coming from South Africa. It was a dream wedding. I enjoyed every moment and finally came home with life-giving experiences. But let the pictures talk instead of me!